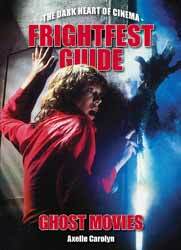 Following the Frightfest Guide to Exploitation Movies, and the Frightfest Guide to Monster Movies, comes the third in the series from Fab Press: the Frightfest Guide to Ghost Movies. This volume is written by Axelle Carolyn – film set and review journalist, short story and screenplay writer, and director of shorts and her first feature, Soulmate. She also penned the very enjoyable It Lives Again! – Horror Movies in the New Millennium. There is also an introduction by Andy Nyman, co-writer and co-director of the British release Ghost Stories, based on the popular West End play. This is a large format softback book incorporating 240 pages of full colour glossy paper. 200 of the most memorable ghost movies from around the world are ‘surveyed’ here in an uncomplicated but precise manner – beginning in 1921 with The Phantom Carriage and ending in 2018 with The Lodgers and Winchester (starring Helen Mirren). This is a book which is appealing to the eye for many reasons. A striking image from John Carpenter’s The Fog adorns the cover, and inside the sheer number of quality photographs and representations of film posters or DVD covers is impressive. Of course, this means there is less room for text, as there is generally one film per page covered. I have heard some criticism of the first two books that there is too little information on each movie, but I think this book is targeted just right, as the horror film buffs, like myself, will use this as a reminder and reference for cast and crew. Less seasoned viewers will surely find this a delight, as a pointer towards those films worth seeking out. Newcomers to the genre will not want to be bogged-down with excessive data which they can find elsewhere if need be. Doing this allows more films to be covered. They’re not all here, but every ghost or supernatural tale committed to film – which is ground-breaking, unusual or just popular – is honoured with basic credits and a paragraph or two of text. A few of my favourite films make an appearance here, including the aforementioned The Fog (1980), the science fiction chiller Event Horizon (1997), and the original Pang Brothers version of The Eye (2002). That’s inevitable, I suppose. Popular films covered in this category include: Poltergeist, The Shining, Insidious, The Others, Sleepy Hollow, The Frighteners, and Ghost. Light-hearted examples include: Casper, Ghostbusters, Beetlejuice, and ParaNorman. All-time classics include: The Sixth Sense, The Entity, Ghost Story, The Changeling, The Amityville Horror, The Legend of Hell House, A Christmas Carol, House On Haunted Hill, and Dead of Night. Foreign stunners include: Ring, Fragile, The Grudge, The Eye, The Devil’s Backbone, and Diabolique – to name but a few. This is an attractive and well-presented book, which has made me think about possibly seeking out the other two volumes. Those of you who appreciate a good hardback can order a limited copy directly from www.fabpress.com.